Let’s face it, planning for a long-distance hiking adventure can be daunting; there are a LOT of details to take into consideration. Before you can begin any overnight excursion out on the John Muir Trail (JMT), you will need to acquire a wilderness permit. This post offers a hassle-free step-by-step guide for obtaining a permit to hike one of the most iconic trails in the United States. As long as you have an open mind to hiking a non-traditional route (although it is becoming more and more desirable these days), then you can easily obtain your permit within a matter of hours…no waiting and no rejections. These instructions pertain to a northbound (NOBO) route starting at Horseshoe Meadow, hiking over Cottonwood Pass Trail then up the Pacific Crest Trail (PCT) until you intersect the JMT. You will need to travel east on the JMT to ascend Whitney and then back out retracing your path to continue up northbound on the JMT. This does add some additional miles to your trip (it is about 30 miles from Horseshoe Meadows to the Whitney Summit); however, this route does have its advantages. Entering the JMT via Whitney Portal is subject to a lottery system. These permits are in extremely high demand. A little-known perk for obtaining a wilderness permit starting at Cottonwood Pass is that your Inyo National Forest wilderness permit is valid for hiking Half Dome! No need to enter yet another lottery. This is one of only two exceptions allowed to hike Half Dome with a wilderness permit issued outside of Yosemite (the other exception is a wilderness pass issued for Cottonwood Lakes trailhead). IMPORTANT UPDATE!!! : This perk had expired at the end of the 2018 hiking season; there will be no exceptions starting in 2019. You will need to acclimate to altitude elsewhere before venturing out on this endeavor. Horseshoe Meadows and the walk-in campground resides at 10,000 feet above sea level. Therefore, you will not have the convenience of gradually acclimating to altitude as you would if you were to start in Yosemite Valley and hike southbound on the JMT. You will be adding some additional miles to your trip, and you will be re-hiking a segment of the JMT that you already hiked. It is approximately 30 miles from Horseshoe Meadows Campground to the summit of Mt. Whitney; however, if you were to enter/exit at Whitney Portal, you would have to hike about 9 miles along the Mt. Whitney Trail, so taking that into consideration, it adds only 20 miles to your trip. Starting the trail at this end, some would say that you would be hiking the hardest part of the trail first. While trekking this portion of the JMT, you will be traversing the highest points of the trail at the beginning of your hike, the terrain itself isn’t any more difficult than some other sections that are considered to be tough. I think the perception that this is the most difficult portion of the trail is mostly because of the fully-loaded pack that you are bearing, and the fact that you are adjusting to the altitude. At this point you don’t yet have your ‘trail legs,’ but as you go along you get stronger, and hiking starts to feel more comfortable. The JMT is a challenging trail, regardless of direction, but I think you also adjust mentally after a while and begin to embrace the challenges, so as time passes, it appears to get ‘easier’ (it doesn’t really get easier, but you are able to endure more). There is some advance prep-work that you will need to do before beginning the application process, which is the stage I found to be rather tedious. You will need to provide a detailed trip itinerary with your permit application; in other words, you will need to specify a campsite location for every night you are on the trail. Although it is mandatory to start on the start date and trailhead as specified, you are not expected to adhere to the itinerary strictly, you do have flexibility and can camp wherever you choose and exit when you desire (with the exception of an exit at Whitney Portal, you are bound to a strict end date due to the quota). Providing a detailed itinerary helps the forest service limit the traffic load on the trail at any given point and can also serve as a reference which can help to locate you in the event of an emergency or if you are reported overdue or missing. 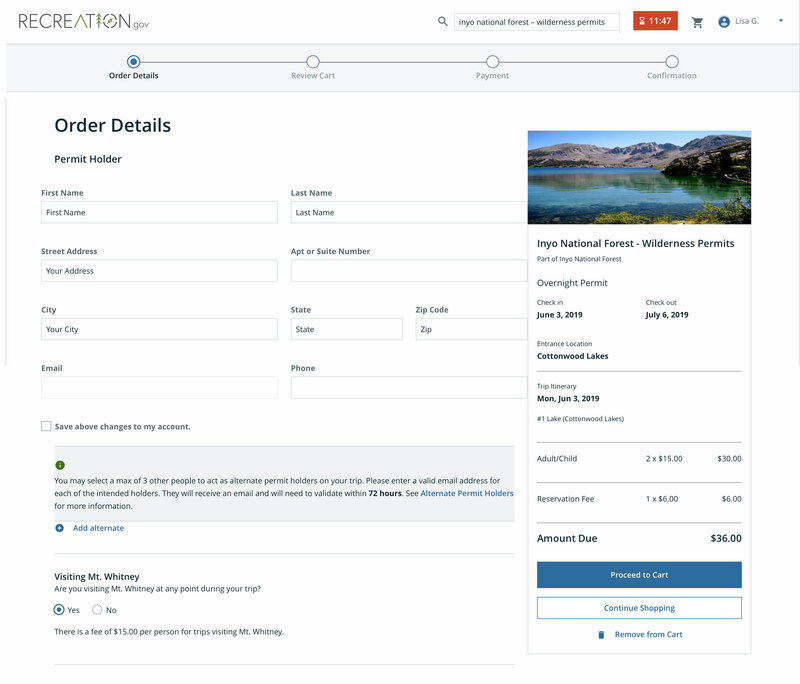 Note: At the time of updating this post, it appears that the newly designed recreation.gov website will allow you to proceed with checkout without filling in the camp locations fields. This may be an oversight and could be corrected in the future, so I would go into the permit application process with at least some idea of what your itinerary will be. However, I suspect that when you go to pick up your permit, you will be required to provide camping locations, so I recommend to be prepared. The trip itinerary drop-down list is organized in alphabetical order. The list items do not necessarily correlate with any map, guide, or online resources that I have found to date and the list is exhaustively long, which makes item selection mind-boggling. 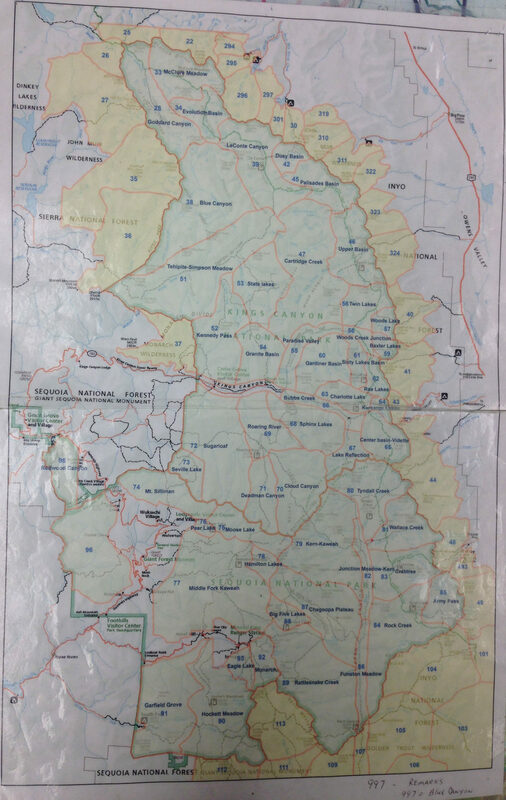 However, I did discover an extremely handy SEKI (an acronym for Sequoia-Kings Canyon National Parks) Backcountry Zones Map that someone named ‘tomba’ posted on a High Sierra Topix Forum (thank you, tomba!). These zones are used in the drop-down list (grouped together using the prefix “SEKI”) for the wilderness permits to designate planned camping locations. This map will help you outline the majority of your hike for the permit. The principal instrument used is the Guthook Guides for iOS. I have used Guthook’s apps for the AT, PCT, and JMT and found it a perfect complement to the other guides that I have used both for planning and on-trail navigation. It is the easiest way I’ve managed to calculate distances between A and B with taking terrain into account. You can easily create trip segments into realistic targets. National Geographic John Muir Trail Topographic Map Guide – This is a waterproof, tear-resistant, and compact guide that maps out the entire JMT. Not only can you visualize the terrain at-a-glance, but you can also see various landmarks that do not exist in the Guthook Guides. Elizabeth Wenk’s books ‘John Muir Trail: The essential guide to hiking America’s most famous trail‘ and ‘John Muir Trail Data Book‘. These two items contain information (such as resupply information, campsite locations, and narratives that walk you through the trail) that is extremely helpful in planning your hike. Between these three tools, I was able to plan out my hike and make an educated guess about which location items to choose for the itinerary. As part of the checkout process, you will need to create an account with Recreation.gov to reserve your permit. The first time I applied for a permit I did it as part of the process, but you can save some time by doing it ahead of time. You can request your permit up to 6 MONTHS before your START DATE. The system will not let you apply for a permit sooner. You will have only 15 minutes to complete your application, so I highly recommend putting in the effort beforehand and completing ‘STEP I – PLAN YOUR ITINERARY’ (above) first. Otherwise, you can run out of time and will have to start all over again. I’ve had this happen the first time I ever did this, and trust me; it’s incredibly frustrating! Be conservative when choosing your end date! If you complete your hike ahead of schedule, that is not a problem; however, if you try to hike through Yosemite with an expired permit (because you took longer than expected), then this could present an issue…especially if you decide to camp at the Backpacker Campground in Tuolumne Meadows. A permit can only be picked up by the group leader or the person specified as the alternate leader on your permit. If you are hiking with multiple people, you may want to designate alternative leaders as a backup. Go to the Recreation.gov website and type ‘Inyo National Forest – Wilderness Permits’ in the search field. Select the wilderness permits selection from the drop-down and then on the next screen, click on the ‘View Details’ button. *Or you can just click here if you don’t feel like typing and clicking. 2. On the next screen, you can take a quick look at the ‘Important Dates’ as there is a special quota season for Cottonwood Pass. If you want to acquire a permit to hike before the quota season begins, you cannot reserve one online and will need to visit an Inyo National Forest Information Center to obtain a walk-up permit for the non-quota season. 4. NOTE: For the purpose of illustrating the permit process, I’ve chosen ‘Cottonwood Lakes’ since, at the time of updating this post, I was unable to select Cottonwood Pass. You will select ‘GT60 – Cottonwood Pass’, unless you would prefer to hike out of Cottonwood Lakes. On the ‘Detailed Availability’ screen, select ‘Overnight’ for the type of permit, then enter the date you want to begin your hike and the number of people in your group. Answer the question ‘Is this a commercial guided trip? This can include an Outfitter, Guide, or pack Outfitter?’ If you select ‘Yes’ you will receive a message that you must coordinate your trip with that guide. 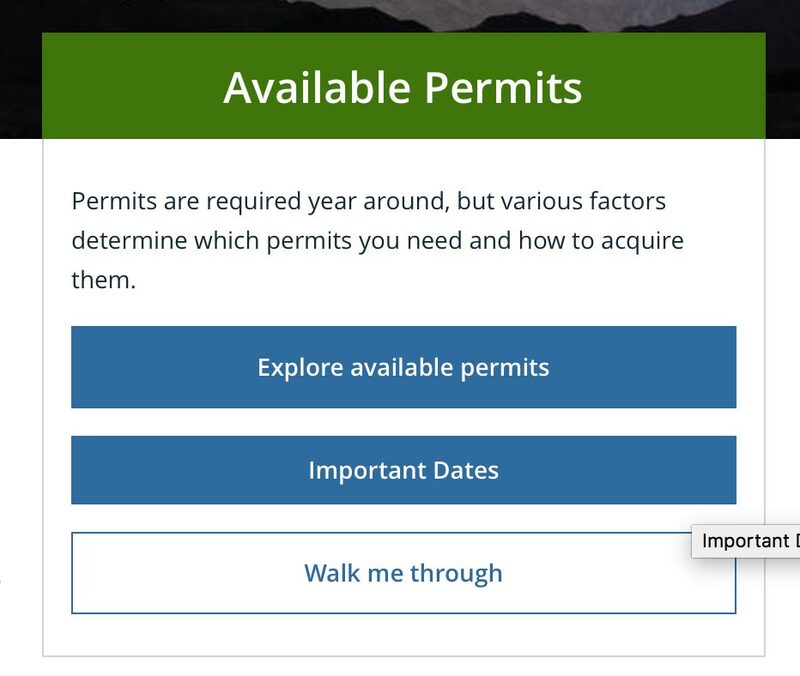 Scroll down to ‘GT60 – Cottonwood Pass’ and if there’s availability (the field will be blue and display the available number of permits), select the date you want. If you’re unfortunate enough to have no availability for the date you selected, choose ‘Next Available’ to see what options you have. You could alternatively take the Cottonwood Lakes trail, which also starts in the Horseshoe Meadow area, but it is a more difficult trail and a little bit out of the way. Click here for a copy of the Horseshoe Meadow area trail map that will illustrate the difference between entering at Cottonwood Lakes trail and Cottonwood Pass trail. After you’ve logged in, fill in your Permit Holder information (this information here is for the group leader). It is recommended you add your other group members as alternate permit holders (up to 3 persons) in the event you yourself cannot pick up the permit. Will you be trekking up Mt. Whitney? If so, select ‘Yes’. 6. Now for the tedious part of the permit application process…entering your trip itinerary. Hopefully, you’ve heeded my advice and already determined your camping locations for each day prior to getting to this step. In Section 1 of the ‘Trip Itinerary’ section, enter your exit date (the date you expect to complete your hike). When you do this, Section 2 will populate with fields that you will need to fill in with anticipated camping locations. As I mentioned in ‘STEP I – PLAN YOUR ITINERARY’, the drop-down list is cumbersome, and you will be tempted to select the option “Other / Don’t Know”. If you choose this option too many times, you may not be able to complete your application. This information is vital to provide useful information for SAR (search and rescue) in the event of an emergency. Filling in these fields is not straightforward. To see the locations available, click in the field and hit the down arrow on your keyboard, this will pull up the full location list to select from. After selecting your camp locations for each day in section 2 of your ‘Trip Itinerary’, select your exit point (where you plan to end your hike) in the ‘Entry & Exit Points’ section. 7. Group size appears again here, why, I don’t know. Perhaps the time in between when you looked for permit availability and the time you entered your camp locations, you decided that you don’t like one of your group members anymore and you want to cut them out of the hike? Or perhaps you are now mad at them for making you complete this tedious application, and you decided they should fill out their own application? Most likely, you can just ignore modification of this field, but make sure it contains the correct number of group members. The addresses of the permit-issuing stations can be found here. 10. Proceed to your cart and complete the checkout process. Congratulations! You have obtained the wilderness permit you need to hike the JMT! You may pick up your permit up to 2 days in advance at the issuing station that you selected on your application. Don’t forget to obtain a California Fire Permit for your hike on the JMT. A special permit is required on the National Forest sections of the JMT for the use of the stove you will most likely be using to rehydrate your food. You can obtain your California Campfire Permit online or at any Forest Service, BLM and Cal Fire office in the state. The John Muir Trail and Thru-Hike Planning – An Excel Workbook to Plan Your Hike! – This post contains a link to download an Excel workbook that I’ve used to help organize and plan my JMT hikes. 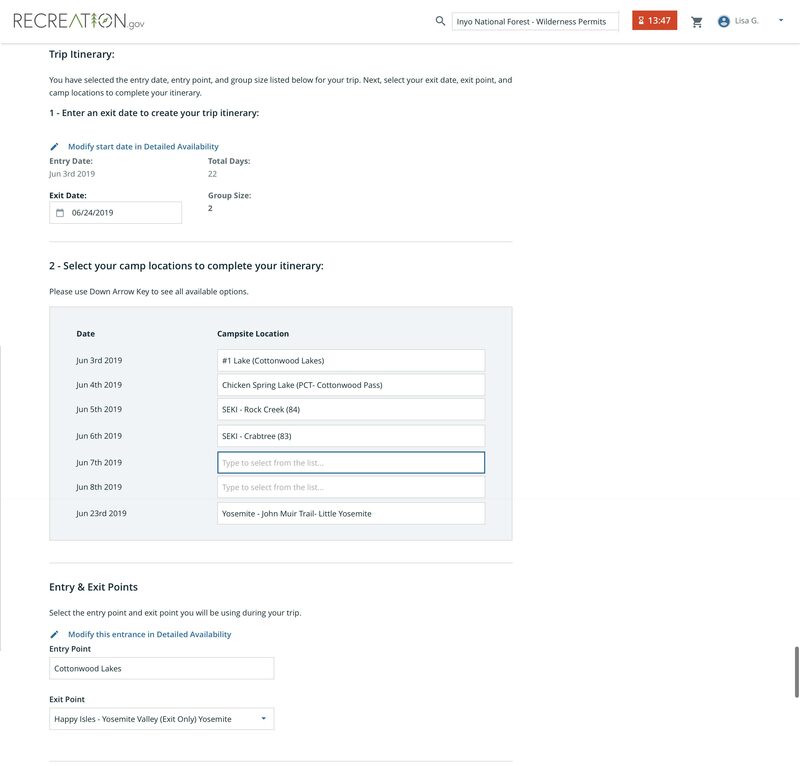 Permit Itinerary Drop-Down List – This is an exhaustive list (in screenshot form, I was unable to export to text) that may help with planning your trip. I apologize for the multiple pages, but as I said, it is a LONG list. Cottonwood Pass-PCT GT60 permit (overnight visiting Whitney) – This link takes you directly to the Recreation.gov website page that allows you to check for Cottonwood Pass permit availability. The ‘Overnight Visiting Mt. Whitney permit selection is set by default. Inyo National Forest Service Permit Pickup Instructions – Instructions regarding checking in at the visitor center to pick up your wilderness permit. Reserved permits can be issued one or two days before the trip. How to request a permit without a reservation is described under “Walk in Permits” on this page. You will also find the addresses of the different permit-issuing stations here. California Campfire Permit Online Application – Campfire Permits are required for the use of portable stoves on federally controlled lands. You may apply for one online. ‘John Muir Trail: The Essential Guide to Hiking America’s Most Famous Trail’ by Elizabeth Wenk – A guide that provides all the necessary information you will need to plan your JMT hike. It contains details about food resupplies, trailhead amenities, and travel from nearby cities (note: this book is written for going north to south. If you want a version that is for going south to north, you will need to download the Kindle version).